Eco friendly cleaning products with Environmental Choice NZ certification. Dishwashing Detergent for manual dishwashing. Concentrated, medium foaming with pleasant lemon fragrance. 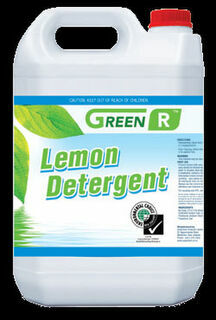 GREEN’R Lemon Detergent can be used on all washable surfaces such as floors (including polymer sealed), enamel, ceramic ware, tiles, plastic, chromium, and steel; and for motor vehicles, car wash machines, etc. Can also be used as a house wash.
GREEN'R are high-performance, cost-competitive cleaning chemicals that give you the assurance of environmental integrity. 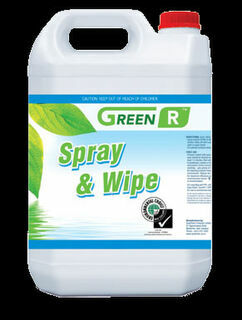 GREEN'R products have Environmental Choice NZ certification. High quality pearlised liquid containing skin conditioners and moisturisers. GREEN'R LIQUID LAUNDRY 5L is a pale blue, viscous, pleasantly scented concentrated commercial grade liquid laundry detergent. 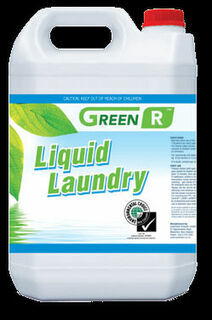 GREEN'R LIQUID LAUNDRY is suitable for use in most laundry machines. Lightly soiled washing: 50ml per wash load. Heavily soiled washing: 100ml per wash load. Front loading and twin tub machines, use half-recommended dosage. All purpose Spray and Wipe. Sanitising and Ready To Use on all washable surfaces. Effectively removes oil, grease, fat, rust stains, carbon and dirt. 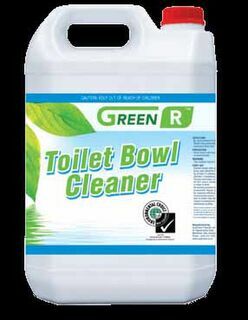 GREEN'R TOILET BOWL CLEANER 5L is a blue viscous mildly acidic thickened toilet and urinal cleaner with a pleasant potpourri fragrance. GREEN'R TOILET BOWL CLEANER does not contain any strong acids. Squirt around the rim of the toilet bowl. Allow contact time before flushing. Brush if necessary. Rinse well. 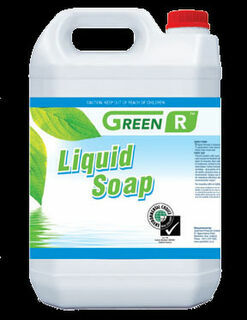 GREEN’R AUTOMATIC DISHWASH LIQUID is a red coloured liquid detergent for automatic dishwashers and sanitiser machines. - Alkaline liquid and effectively neutralises fats and greases and removes all food soils from crockery and cutlery. - Formulated for use in soft and hard water areas and prevents build-up of hard water scale on interior of the dishwasher machine. 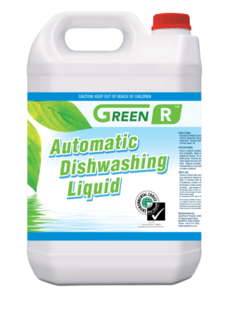 GREEN’R AUTOMATIC DISHWASH LIQUID is used through automatic precision dosing systems on industrial dishwashers. For Soft water, pump 2ml into 1 litre of water. For Hard water, pump 3ml into 1 litre of water. purpose, hard surface cleaner based on D’ Limonene. - Prevents stubborn soil and suspends it for easy rinsing. - Cleans and deodorisers in one operation. - Particularly effective against oil, grease and protein stains. GREEN’R CITRUS CLEANER can be used on any washable surface – walls, tables, benches, work surfaces, floors, concrete, terrazzo, ceramic tiles, etc. GREEN'R RINSE AID is a clear, blue coloured liquid rinse additive for automatic dishwashers. - Assists in preventing scale build-up due to hard water salts. - Ensures quick water drainage providing dry, sparkling, spot-free glassware, crockery and cutlery. - Economical - only requires a small dose per rinse cycle. - GREEN'R RINSE AID is formulated to ensure quick water drainage, eliminating water spotting and producing streak-free results on crockery, cutlery and glassware in automatic dishwashing processes. Automatically pump GREEN'R RINSE AID at 5ml into 10 litres of water. This product is intended for automatically dosed dishwashers for professional use within institutional and catering facilities, and not for use in domestic type dishwashers. Works well with Green'R Automatic Dishwashing Liquid. 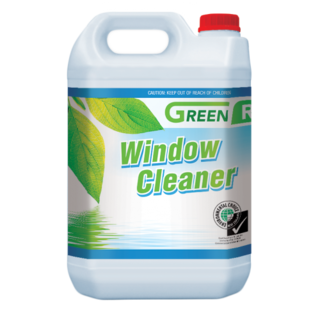 GREEN’R GLASS CLEANER 5L is an ammoniated clear blue alkaline window and glass cleaner, which produces outstanding results. Quickly and effectively removes dirt, grime, fingerprints, smudges, grease and smoke film. Safe, economical and easy to use. Fast acting and fast drying. Environmental Choice New Zealand licensed. GREEN’R GLASS CLEANER is the ultimate cleaner for glass, optical lenses, windows, mirrors, vinyl, leather, chrome, porcelain, formica, ceramic tiles and most plastic. Spray on GREEN’R GLASS CLEANER or apply with a window brush. Squeegee dry or wipe and polish with a lint free cloth.